QUICK action by police officers in Kitwe has prevented the smuggling of more than 500 bags of mealie-meal hidden near Chingola cemetery. Police have since apprehended one person to assist with investigations. 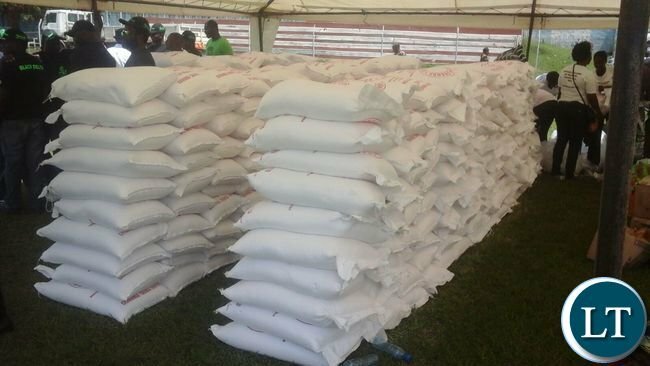 Kitwe District Commissioner Chanda Kabwe said in an interview that the mealie-meal en route to the Democratic Republic of Congo (DRC) was discovered on Saturday. Mr Kabwe commended members of the public for alerting the police about the merchandise which was hidden in a bush. “We have declared war against mealie-meal smuggling in Kitwe. The police and the public are on higher alert and those found wanting should be ready to face the law,” he said. Mr Kabwe also refuted media reports that there was a mealie-meal shortage in Kitwe. He implored the media to verify their reports. This was after he conducted an on-the-spot check in various outlets and discovered that the commodity was available. “I am wondering how the district would have a shortage because on Friday I toured Chimsoro, Olympic and H and M Milling where I found that there was a lot of mealie-meal and there were no queues,” Mr Kabwe said. Meanwhile, police in Kitwe have retrieved a body of a one-year-six-month-old baby who was dumped in a well in Kawama Township. Copperbelt police commissioner Charity Katanga said the body was retrieved at the weekend and investigations had been launched. In Ndola, a 12-year-old boy of Chifubu Township has committed suicide after being accused of stealing K50 by his parents. Ms Katanga identified the deceased as Patrick Kapotwe, a grade eight pupil at Chifubu Secondary School. Ms Katanga said the deceased of house number 1258, Bonaventure Teachers’ Compound, went missing after his parents accused him of stealing K50 and was found dead under a mango tree with a rope tied to his neck at his grandfather’s home in Chifubu. She said the incident happened yesterday around 05:00 hours. “We have a report of a sudden and natural death in which a boy was found dead under a tree with a rope tied to his neck. “It is alleged that the boy was accused of stealing money from his parents and that he left home and did not spend a night, but was later found dead at his grandfather’s house in Chifubu,” she said. Ms Katanga said the body of the deceased was in Arthur Davison Children’s Hospital mortuary awaiting a post-mortem. Someone is being generous enough to try & feed the dead. Vote for Lungu to return back to UNIP days of smuggling and mushala. What really is wrong with selling mealie meal to DRC or any other country for that matter? When will proper exports start? HE edgar Lungu should invite Anthony Mwamba we seem to have a lot of flowers in our country. Its high time we put working brains like Mwamba in offices. Nshimbi we cant sell to CONGO when we don’t have enuf for ourselves. What these pipo are smuggling is paid for or subsidized by our govt. why should govt subsidize maize and end up in other country? The chaps who did that know that most Zambians pretend to be Christians yet they are so much into spiritism and ritualistic stuff, they knew hiding mealie meal near a grave which Zambian would dare talk about it, the guy who spilled the beans is just one in million Zambians. You try to prove this just pound some innocent charcoal spray them on the entrance to your boss office, you will see how your Zambian boss will urgently call for concoction of public prayers from pastors and talks with sangomaz, to dare whoever has done that on him, that Zambia for you. Well done guys. Let those behind this barbaric actions be charged with maximum sentence. We all know that the price of mealie meal should around K58 but because of some known selfish and greed “business men” they want to punish innocent Zambians for political millage. Lets all be patriotic and shame the opposition who want to destroy our economy. Bet you , no one wants to buy this lot! Not even if it’s free! Good work finding it. Radio station should start playing that old song called “Smuggler A Pwisha ubunga”. Those who were around in the 80’s should know this song. Maybe Pilato should do a remix. We are always looking for foreign exchange and we always look at the mines. The answer is right under our noses but we cant see it. Increase the maize production in Zambia and supply DRC with it. Lets just forget about mines as long as they are in private hands. Support our local farmers and bring development to the country. In the future we shall hear of a foreign Investor who will set up a farm just to supply the Congo market. So the people in DRC don’t know how to grow maize? Someone told me that their (Congolese) specialization is just music and night life – that they sleep during the day and are hyperactive at night. Those are Kasais for you. Its mostly a rain forest that can not support maize. Police should also routes between Drc and Mufulira. A lot off meali meal is being smuggled using mukambo and sakanya. Is the punishment for the criminal offence of smuggling stiff enough to scare the would be smugglers from the act? Make it a non bailable offence so that we can root them smugglers from society. Imwe those bags are for the dead, and if you continue holding them, they will disappear. You want to pretend to be working? Are we not supposed to engage in foreign trade to earn the dollar and lower the madness of Kwacha?